I have a cold, but just a little cold. Not enough to knock me right out, but enough to be really annoying. I can't cough with much vigour because my abdominal muscles (who knew I even had any?) still hurt from my Wednesday workout. I'm doing tiny little lady coughs that aren't actually accomplishing anything, and I sound like an idiot. It's a good thing that I'm working from home today. 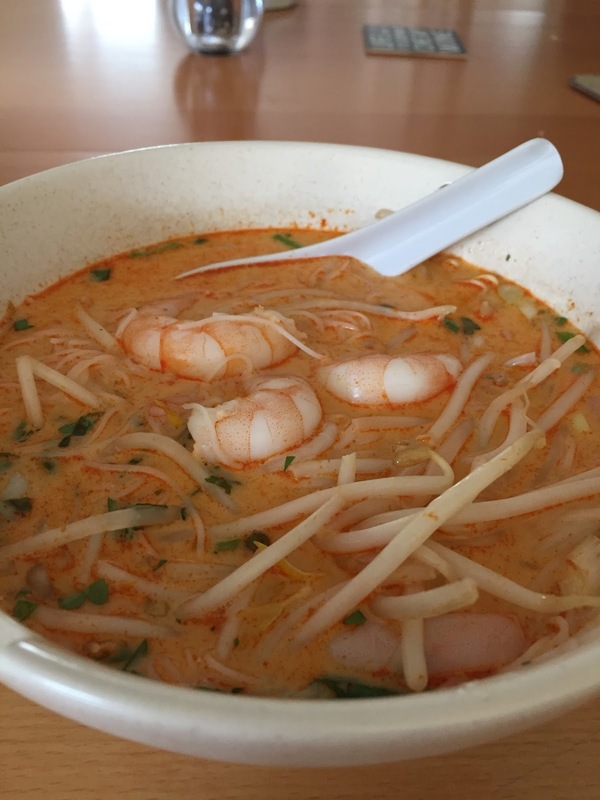 My lovely friend Georgia posted a recipe yesterday for a Thai-inspired soup, and it sounded like the perfect remedy for a cold. One of the benefits of having a terrible short term memory is being pleasantly surprised by things I find in my cupboard that I forgot I bought - like a tub of Penang curry paste. I'd just made some chicken stock to help knock out Jack's cold, the weather turned cold and rainy today, so soup was the sensible lunchtime conclusion. I made this recipe up based on what I'd usually add to my standard Thai curry, with a little nod to laksa. I only needed to feed me today, so I made the full batch of soup but didn't add the noodles, prawns, or lime juice to the pot. I added these to my bowl and ladled the hot stock on top, and put the rest of the soup in the fridge for another day. The paste I used was pretty hot, so not only are my sinuses clearer, I can see through time. (Thank you for that reference, Lisa Simpson.) If you've got leftover chicken or some other form of animal protein, by all means use that instead of prawns. This isn't even remotely authentic. 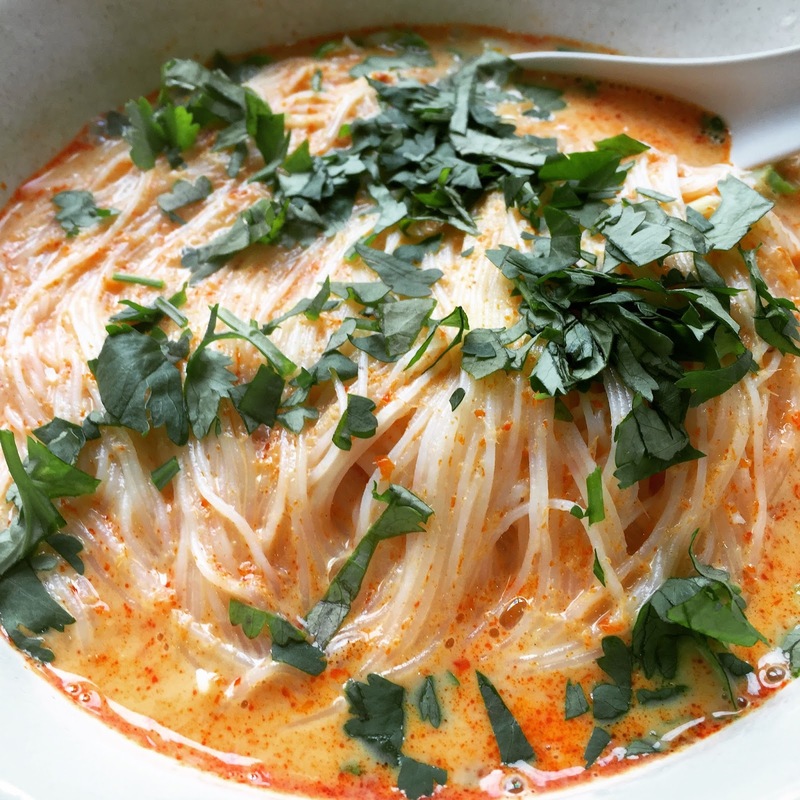 It's like a thinned out Thai curry on rice noodles instead of rice. I'm not really selling this, am I? It's good. Trust me. Oh look, there they are. Garnishes: bean sprouts, coriander/cilantro, spring onions/green onions, or whatever else strikes your fancy. Fry the curry paste in the oil over medium heat for about 2-3 minutes. Add the coconut milk and stock, and bring to a boil. Turn the heat down and simmer for 15 minutes or so. While the soup is simmering, add boiling water to the vermicelli and let stand according to package instructions. Mine only took three minutes, so you can do this near the end. Drain and set aside. Add the fish sauce and palm sugar to the soup and stir until the sugar dissolves. Add the prawns* and noodles, stir and heat the soup through for a minute or two. Squeeze the lime juice on top. Ladle/pour/slop the soup into bowls and top with your garnishes. Say goodbye to your cold. *If you're using raw prawns, throw them in at the end for about two minutes, and cook until they're thoroughly pink. Per serving: 499 calories, 23g fat, 24g protein, 48g carbs.